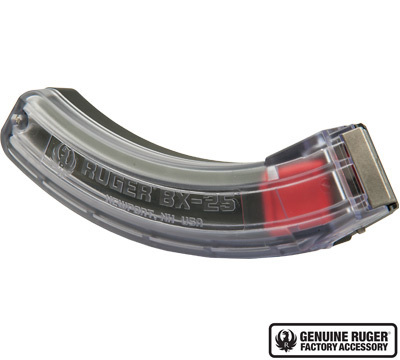 This genuine Ruger® factory magazine with Ruger logo has been tested and has proven to feed as reliably as the standard BX-1 10-round Ruger® rotary magazine. 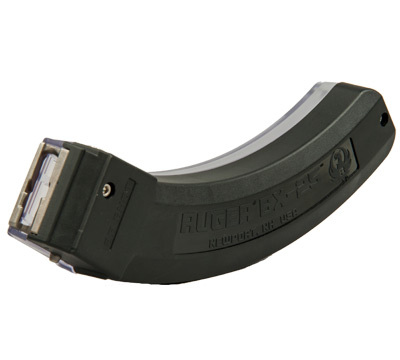 BX-25® magazines will work with any factory original 10/22® Rifle, SR-22® Rifle, 22 Charger™ Pistol, .22 LR Ruger American Rimfire® Rifle and .22 LR Ruger 77/22® Rifle. Ruger cannot bill to or ship 25-round magazines to the following states and cities: California, Colorado, Connecticut, Hawaii, Maryland, Massachusetts, New Jersey, New York, Vermont, Washington, DC. ILLINOIS: Aurora, Cicero, Skokie, Chicago, North Chicago, Chicago Heights, Cook County, Buffalo Grove, Dolton, Hazel Crest, Highland Park, Homewood, Melrose Park, Oak Park, and Evanston. DO NOT ORDER THIS PRODUCT if you live in these locations. Have fired well over 500 rounds with it with no jamming. 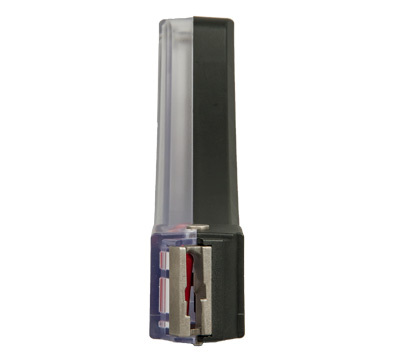 Easy to load and the clear side makes it easy to see how many rounds you have left. Definitely worth the money. Plus the banana clip makes it look cool.